« New Free Embroidery Pattern- Fat Christmas Cat! 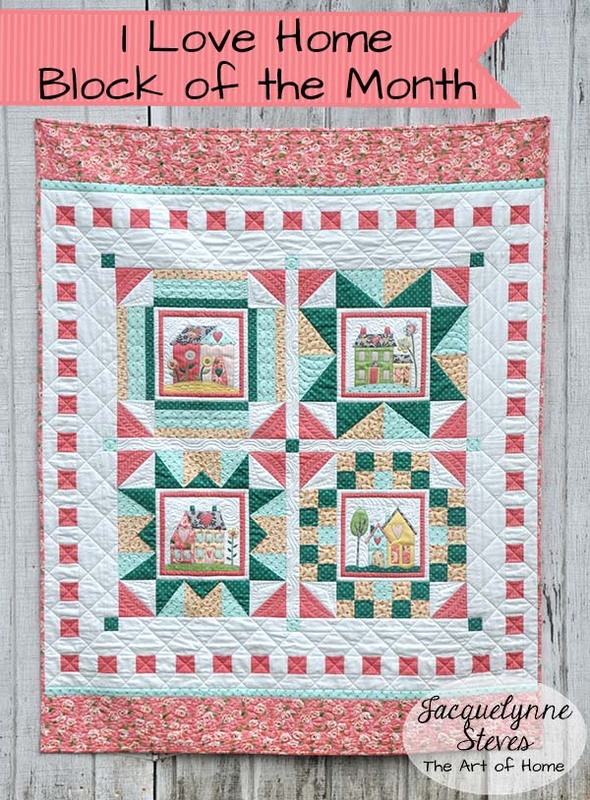 Today we are releasing the border instructions for our block of the month quilt! Wow! What a fun adventure this project has been! THIS IS EXTREMELY IMPORTANT- THE PATTERN LINKS WILL BE DEACTIVATED ON DECEMBER 31. THAT MEANS THAT IT’S NOT ENOUGH TO SIMPLY SAVE YOUR EMAIL WITH THE LINKS, YOU MUST DOWNLOAD AND SAVE THE PATTERNS! Even though this is the last month of patterns and instructions, in January we will be having a HUGE GRAND PRIZE GIVEAWAY!!! Be sure to stick around for that! It’s time to take a look at the finished quilt! Before I show you the photos of my finished quilt, let me show you what happened while I was taking those photos! I had a visitor in the yard!! He had been hanging around in the yard all morning, which I thought was odd since skunks are mostly nocturnal, so I called Animal Control. The officer came out and said that since the skunk was not acting erratically, it was most likely out foraging since the weather was turning colder. He told me that usually skunks will give you a warning before spraying, they will charge you and jump up and down on their front paws. So later, I went outside to take my photos and took Alfie out with me. Just about 2 minutes later, I heard Alfie barking like crazy- I ran over, and there was Alfie sitting right next to the skunk and barking his head off! I calmly called Alfie over to me (thank goodness he obeyed! ), I gave him a whiff and no stink!! Thank goodness again! I called him into the house, and went back out and found the skunk just “moseying” around the yard, and heading toward my quilt. I just had to wait it out to see what he would do! He walked by the quilt, took a look at it, and luckily he didn’t think that the quilt “stunk” and kept going! I have not seen him since, though I suspect that he may be living in our barn so we’re still keeping an eye out for him. This month’s Sponsor! 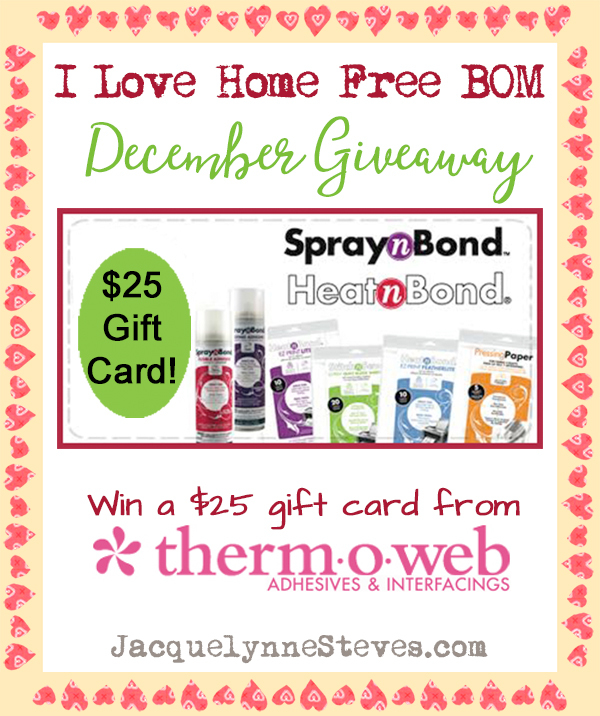 Thermoweb! 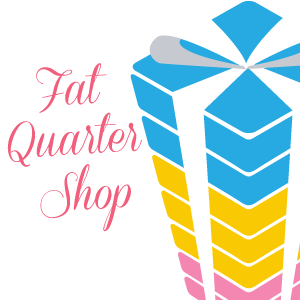 They manufacture high quality quilting, sewing and crafting supplies. Also stop by their blog for helpful tips and tutorials! 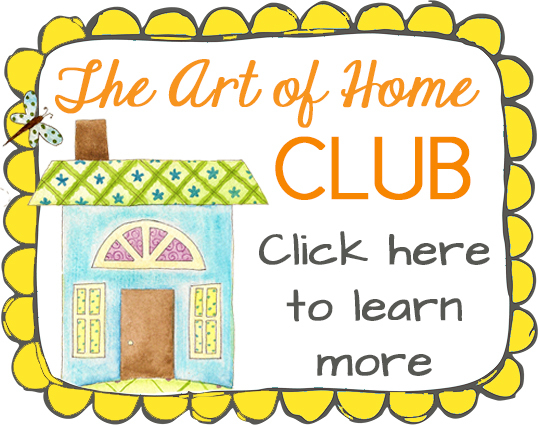 This article was posted in Block of the Month, Blog Hops, Embroidery, Featured, Fusible Machine Applique, Giveaways & Contests, Sewing & Quilting. Bookmark the permalink. Follow comments with the RSS feed for this post.Post a Comment or leave a trackback: Trackback URL. I have really enjoyed this BOM. Thanks for doing it for us. It’s times like these that I wish I was a member of Facebook, Instagram or Pinterest. Flickr is as close as I get. 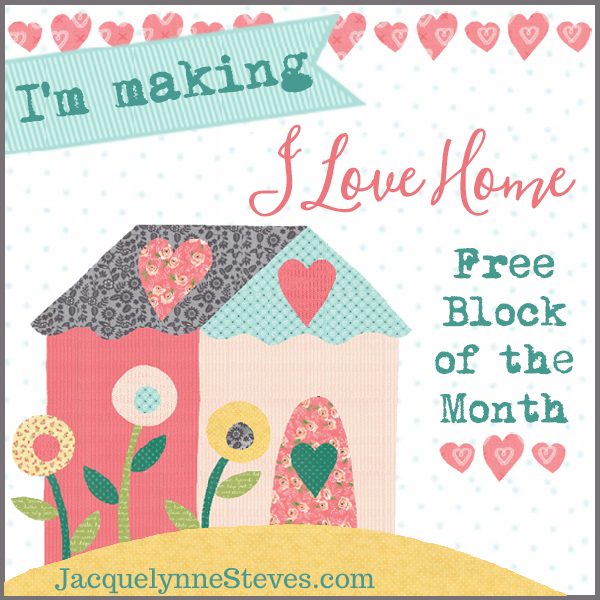 Thank you so much Jacquelynne for the I Love Home Blocks! I love them, even though I still need to make the last 2 (next year). I appreciate you sharing your talents and motivation. Have a wonderful holiday season with your family! I soooooo enjoyed your BOM, but I truly needed a great laugh and watching that video did that. THANK YOU for sharing with us. You are an absolute great inspiration. The skunk seemed to approve of your quilt! I can’t believe he didn’t spray your dog! Our dog was first caught by animal control when she was young. She’d been skunked. We adopted her a short while later, and she HATES skunks, and still wants to chase them. If we open the back door and get even a little whiff of skunk, we have to hold her back and not let her out! I’m a bit behind because I was away for a couple of weeks and had to finish my granddaughter’s quilt first, still have to do block 4. Hope to catch up soon. I love the quilting on your quilt. I love your I Love Home BOM. thank you so much for making it available. Thank you for the BOM. Such a sweet quilt. I really enjoyed doing this BOM (not finished yet …). Thank you! Thanks, I have enjoyed getting to know your work through this QAL. Now, to work! Thank you for this BOM. 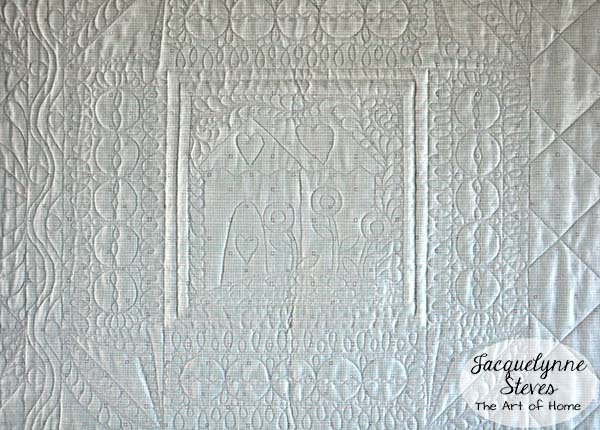 I’ve downloaded the patterns and am looking forward to making the quilt when I retire from my job for the second time. The blocks are darling. THANKS FOR SOME GREAT INSPIRATIONS AND A MERRY CHRISTMAS AND HAPPY 2018 !!! Jackie, Thank you for doing this darling design! I will hopefully get to work on it after the first of the year, if (IF) you don’t come out with another overly-tempting pattern for me to play with. Thanks for making me go visit all the sweet blogger who worked along with you, it was a delightful reconnection with some of the gals. 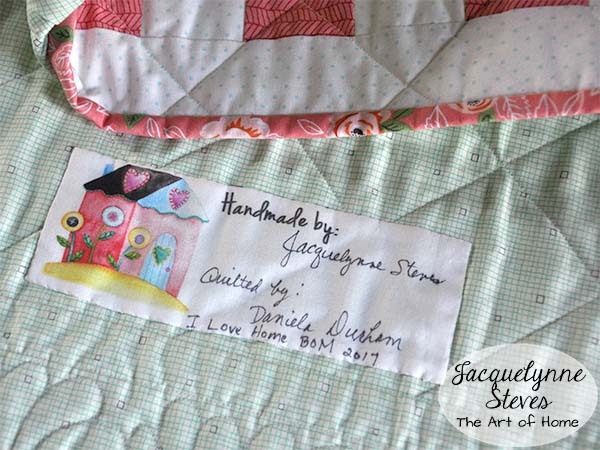 I loved the video, Jackie – I’m going to tell the quilt recipient that it’s “Skunk-Approved”! She’ll get a real kick out of that. You’re so lucky Alfie didn’t get skunked – it must be a pretty placid skunk to let a dog sit next to it barking. I hope you have a great holiday – Merry Christmas to you and yours! Thank you for the I love home block quilt. I am a little behind, but having lots of fun. I can’t wait to see what you have planned for us next year. I love using light weight fusible interfacing for my applique. You’re video was too funny ..watching that skunk “mosey” along…at first I thought it was a cat or small dog then your closeup showed the white line….whoaaaaa nelly……. I’ve enjoyed this BOM and look forward to the next BOM next year. Have a great Christmas. 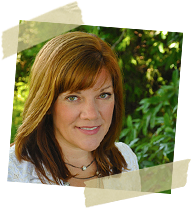 THANKS FOR SHARING FUN PATTERNS,VIDEOS,INSPIRATION+! Thank you JACQUELYNNE for the BOM. I appreciate all who share their love for crafting with others. You are appreciated. These are adorable – I’m going to embroider them in REDWORK vs quilt. Thanks so much for sharing. Have a lovely day. I loved seeing your extra ‘model’ in the photo shoot. Thanks for the reminder to download all parts of the pattern. I had forgotten one part but now I have it. Thanks for sharing.